Home > Jamaica Tours > Negril Tours > Mayfields Falls Tour from Negril. Our Mayfield Falls Tour from Negril takes you on a journey through one of Jamaica’s largest sugar cane plantations in the mountains of Jamaica to discover this beautiful paradise known as Mayfield Falls. Just right for nature lovers and adventurers alike. Mayfield Falls is the ultimate experience while in Jamaica. This Tour offers an interactive experience that will revitalize you. With 21 natural pools made from the cascading crystal clear water from two of the most beautiful water falls in Jamaica. Relax and take in the magic of Mayfied Falls, one of Jamaica's best kept secrets. 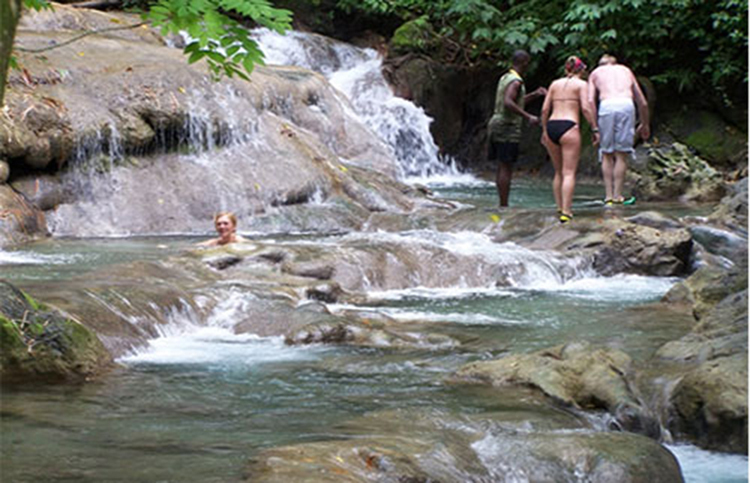 Be refreshed by the 21 different types of ferns, birds and plants as the crystal clear ever flowing waters of Mayfield Falls massage your feet as you walk and climb through this Mayfield Falls Jamaica adventure . Enjoy a scrumptious meal from our in house chef to compliment your after journey appetite and blow your taste buds away. The Mayfield Falls experience is breathtaking, this is a must while in Jamaica. YS Falls Tour from Negril. Ask a question about the Mayfields Falls Tour from Negril.